So today I was given the Honest Scrap Award. Actually, I got an email from a fellow blogger that used the phrase “now it’s your turn.” Which is a little menacing, but I won’t hold it against you, Lucinda. 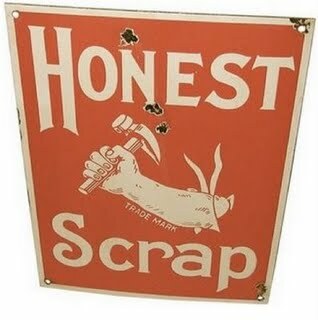 From what I gathered from the interweb is that the honest scrap award is passed from blogger to blogger and when it falls on your lap you have to do two things. First and foremost you have to share with the world ten completely honest and true things about yourself. Then, you have to implore other bloggers to do the same. So, world, here are ten facts about myself. Actually, they’re a mixture of facts and anecdotes. I’m a story teller. 1. My full name is Elena Brent Rosemond-Hoerr. My first name is after a little girl that used to come into the clothing store where my mom worked. She would bring my mom fruit. My middle name is after my mom’s good friend Brenda Taylor, whose birthday I share- July 7th. 2. The first time I met Dan we were waiting in line at MICA’s Cafe Doris on a break from the Exhibition Development Seminar. I showed him my compass. It was a GoreTex compass. It was awesome. 3. The only nickname I’ve ever received is Enie. I have a cousin, Taylor, who is 5 days younger than I am, who couldn’t pronounce Elena. My family’s favorite anecdote to tell is when I cornered Taylor and smothered him with kisses (we were 2 or 3) and he exclaimed “too many kisses Enie!” Most of my family still calls me Enie. 4. When I was a junior in college I dyed my hair dark red. My dad was furious and kept giving me dirty looks because “Rosemonds are blonde.” During the winter my hair is a light brown, but during the summer it gets white blonde, especially when I was a lifeguard. Not to mention that my father doesn’t have enough hair to really be a blonde anymore. 5. My mom is from Ewing, NJ and when we were growing up we would drive up there for the holidays. Inevitably along the road my mom and I would get in a fight and start giving each other the silent treatment. I can maintain the silent treatment for days, but my mom has a short attention span. So when she was tired of ignoring me she would turn up the (disco) music and start dancing in my personal space. She always broke me. 6. Gilmore Girls is my favorite tv show. Keep your criticism to yourself, I’ve heard it all. That show, along with everything made by Julia Styles totally shaped my formative teen years. 7. My dad is 6’9. I’m 5’11. My brothers, Reid & Ryan, are 6’2 and 6’5 (approximately, they grow so fast). My mom is 5’6. She looks so cute and tiny standing next to my brothers and I. 8. When I got married in September I inherited the most adorable 3 year old niece, Meredith. She’s the smartest child I’ve ever met, and her ponytails form natural ringlets. 9. I have a stepsister, Lauren, who is 6 months older than me. On her 16th birthday, she got diamond earrings. On my 16th birthday my dad and I got SCUBA certified. Now half of my family and my husband are certified and my dad owns his own dive charter. Smartest birthday present I’ve ever asked for. 10. Before I started dating Dan the strongest thing I drank was black tea, maybe the occasional pumpkin spice latte. Now I drink two cups of black coffee every morning. When I made the transition from tea to coffee it only made sense to hold the milk. I really don’t care for milk. So there it is, 10 little things about me. Now about the other bloggers. I made a short list and then I started having this feeling in my stomach and decided not to. Since a lot of my readers are bloggers themselves, here it is. To steal a line from Lucinda, now it’s your turn. Post your 10 things here in the comments or on your own blogs (link it back here!). Have fun! And HAPPY THANKSGIVING! 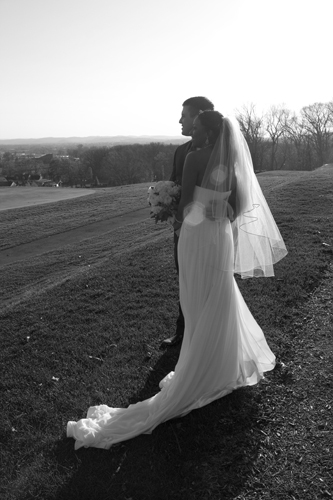 A few weeks ago, I was the wedding photographer for a friend, Candice. Candice is the older sister of my close friend Kellie from college, and she’s one of the nicest people I’ve ever met. When she got engaged the day after I did, she asked me to be her photographer and I was delighted. So, the first weekend of November we hiked up to Lewisburg, Pennsylvania and spent the weekend celebrating with the happy couple and their (incredibly fun) families. Because I never go anywhere empty handed, I brought up a pie. At first I was going to bring my caramel apple pie, but then I changed my mind and decided to bring cupcakes. Then I changed my mind again because I was invited to join this Springpad Thanksgiving recipe contest and I needed to try out my perfect Thanksgiving pie idea before the deadline. I came up with the plan for this pie a few months ago and I am so excited about it. 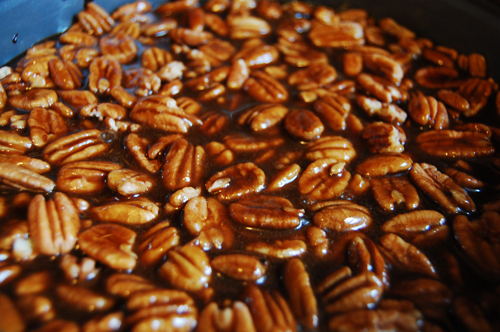 One of my favorite holiday treats is the caramel turtle, a chocolate candy stuffed with caramel and pecans. Usually when a candy has the chocolate/caramel pairing the chocolate is hard and the caramel bursts out in a displeasing fashion. Not so with the turtle. It’s all the same consistency and texture. It all smooshes together and nothing bursts. I really hate it when the caramel bursts out. This pie is layers of chocolate ganache, caramel, and toasted pecans. Candice called me a few days after the wedding and told me how much she and Trent (her new husband) were enjoying the pie. My favorite part was when she told me that Trent cut himself a big piece, exclaimed “this is like eating 10 candy bars” and couldn’t finish it. I love when I make pies that are too rich for even the biggest sweet-lovers to eat. It’s as good as winning an award. This is also a good time for me to announce, officially, that Dan and I started a small business this month, Pressed Magnolia Studio. I’d always kind of felt like working as a wedding photographer was a sell out of my BFA in photography, but something about seeing Candice tear up the day after the wedding while looking at the pictures just made me so happy. Made me think I could do it, officially. So here we are. 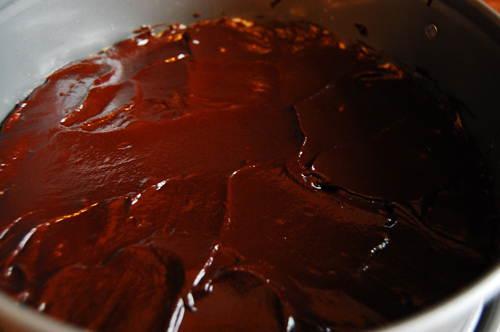 In a double boiler, melt the chocolate. When it is melted, stir in the cream. Bake the pie crust in a pie dish with nothing in it. Allow to cool. Poor half of the ganache into the pie dish and let cool. Heat sugar and water in a heavy medium size pan over medium-high heat. Stir constantly as sugar melts and turns a golden color. When sugar is completely liquid, remove from heat. Add cream and continue stirring. The caramel will bubble and steam like crazy- it’s okay, just keep stirring. When it is calmed down, allow to sit for 15 minutes. When the ganache has hardened in the pie dish, pour half the caramel over it. 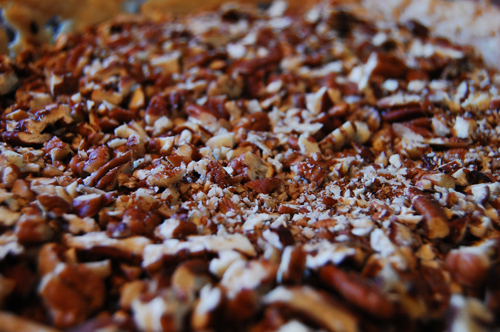 Toast the pecans for 3 minutes at 350. Chop and spread over layer of caramel. 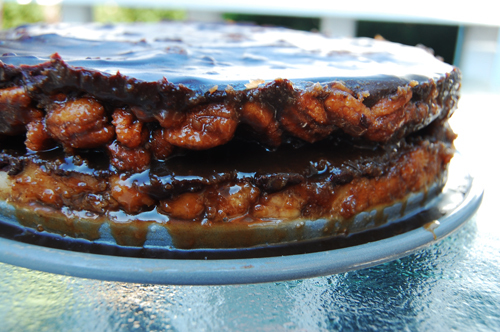 Cover with another layer of caramel- use the remaining. 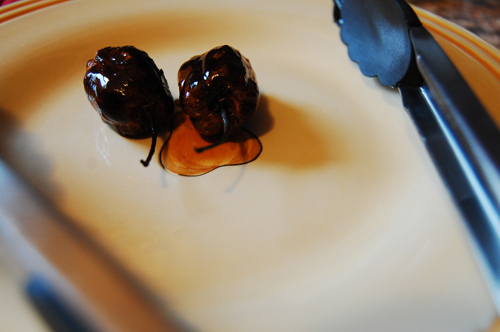 Top with the remaining ganache. Let sit for 2 hours or until everything has cooled and set to room temperature. **The second time I made this pie I used a springform pan, which was awesome because it allowed you to see the layers. If you’re going to do this follow the same instructions, just make sure to butter the edges of the pan so that it comes apart easily! Nothing freaks me out as much as cooking whole turkeys. Part of it, I think, stems from my years as a vegetarian. Cooking all meats makes me squeamish, but there’s also just something about turkey. Roasting whole chickens, which is essentially the same thing just a little smaller, makes me uncomfortable, but it’s doable. But the turkey. The big, honking, scary turkey gives me agida. Ogeda? The willies. You know what didn’t help? This year, MY TURKEY DIDN’T HAVE LEGS. I spent more money than I’m willing to admit on an organic free range antibiotic free Whole Foods approved turkey because Dan and I are on this kick where we’re buying ethically raised meats. And on top of being antibiotic free, it was also leg free. And you know what helps you understand which way is up when cooking a turkey? THE LEGS AND WINGS. I couldn’t figure out which way was up! It’s whole center of gravity was off, it wouldn’t sit straight in the roasting pan and it kept falling over and I’m 99% sure I cooked it upside down. Thankfully, even though I cooked it upside down and I had no legs to truss together and I was home sick with a nasty stomach bug, it tasted amazing. Totally delicious. Now, you may think that the whole habanero thing is intense and scary and way too spicy for your “not the pepper again” family, but it’s not. First of all, roasting a habanero takes a lot of the punch out of it, and so the marinade gives the skin a little extra (very subtle) flavor, and keeps the meat perfectly moist. It’s incredible. 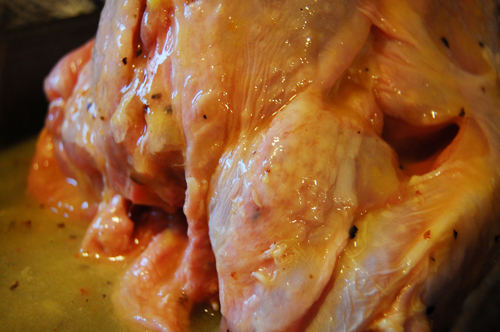 *If you’d like your turkey to have an extra punch, you can inject the marinade into the meat of the turkey. If you’d like to do so, double all the ingredients (save the turkey) and make twice as much marinade. Heat your oven to 400 degrees. 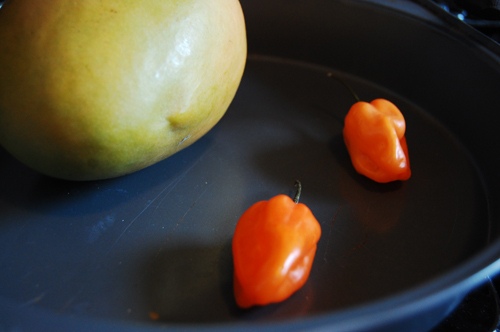 Roast whole mango for 90 minutes and whole habanero for 20. Let cool. Peel mango and use a knife to scrape pulp off into the food processor. Combine with orange juice and pepper. Blend. Remove your turkey from it’s packaging and remove any innards. Slather with marinade. Cover in plastic wrap and marinate overnight. When you’re ready to cook your turkey place in a roasting pan legs up. Tie the legs together. Fit your turkey triangle. 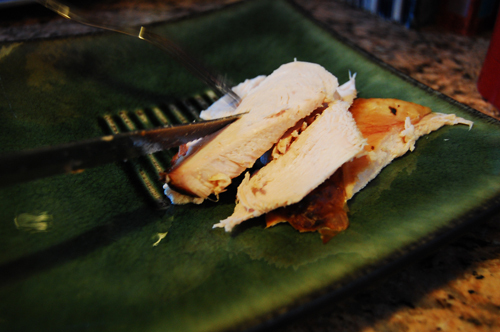 A turkey triangle keeps the white meat juicy while cooking the dark meat. Make a triangle out of the foil and fit it around the body of the turkey. Heat your oven to 500. Cook turkey at 500 for 30 minutes (without triangle). Then drop the temperature down to 350, put on the triangle, and cook until the temperature of the breast is 165. Allow to rest 20 minutes before carving.